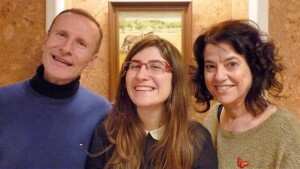 Your Family in Madrid offers homestay for students with half board or full board. This method is ideal for students and trainees to stay in Madrid for a period ranging from several weeks to several months. Being welcomed into family and cared for in a warm environment is the best way to adapt to the culture and lifestyle in the capital of a new country, leaving you to focus on your studies. Don´t hesitate to contact us if you have any questions relating to transportation, administrative procedures, or any worries: we are available throughout the duration of your stay via our emergency phone. – Single or double room (for students travelling together only). The rooms have one or two beds, a wardrobe, one or two tables so that students can study in their bedroom. You can have a private bathroom with a supplement. – Half board (breakfast and dinner with the family) or full board (breakfast, lunch – in general lunch box on weekdays and meals with the family on the weekend- dinner with family). – Students have a key to the accommodation. – Access to the communal areas of the home. We also offer homestay for students wishing to spend a semester or a whole year in Madrid in a warm family setting. We offer complete support, both for minors and young graduates, in Spanish families. The services offered are similar, but the meals included are half-board on weekdays and full board on public holidays and weekends. This plan is flexible to cover all the needs of students (full board days can not however exceed 5 days a week). The monthly rate is fixed during the whole stay, but calculated according to the number of nights for the month of arrival and departure. You are coming to Madrid for a job or an internship, and you need to “refresh” your Spanish skills? Groups (8-10 students), generally from Monday to Friday. – Contact us and we will send you our homestay for students questionnaire so that we can get to know you better and start looking for families that best match your profile and your preferences. – A deposit will be required for any booking confirmation. The deposit will be returned within one week after the departure of the student.